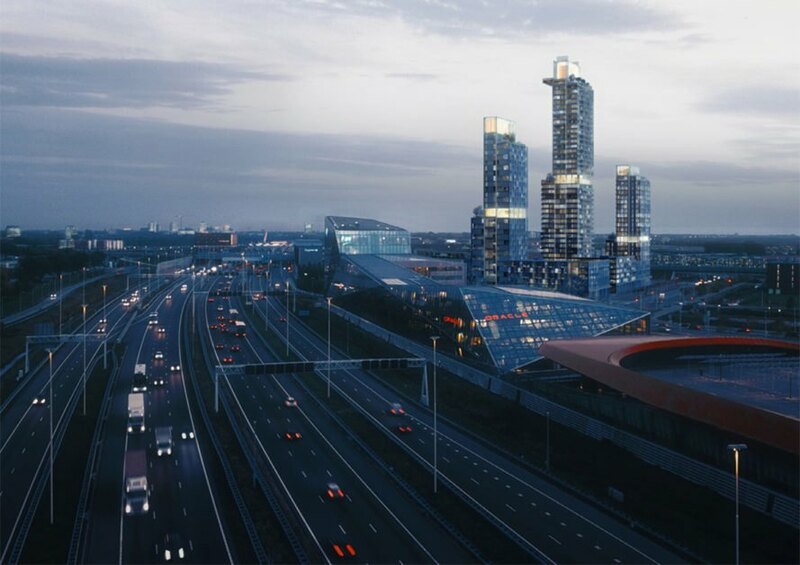 A trio of high rises are expected to outreach Utrecht, Netherlands’ tallest building and be a beacon of sustainable urban living in the historic city. 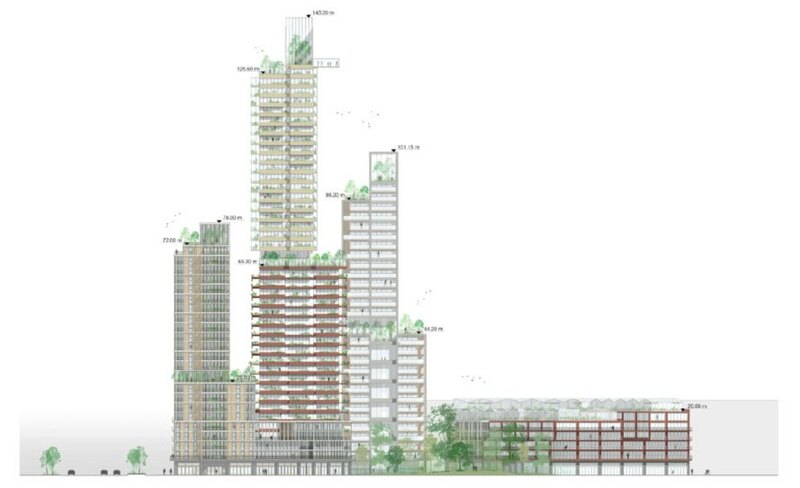 The MARK Vertical Village, designed by a consortium of architects and developers, won a recent high-rise development contest and the team plans to break ground starting in 2021. The residential buildings will surround an urban forest and feature extensive greenhouses at their pinnacles. 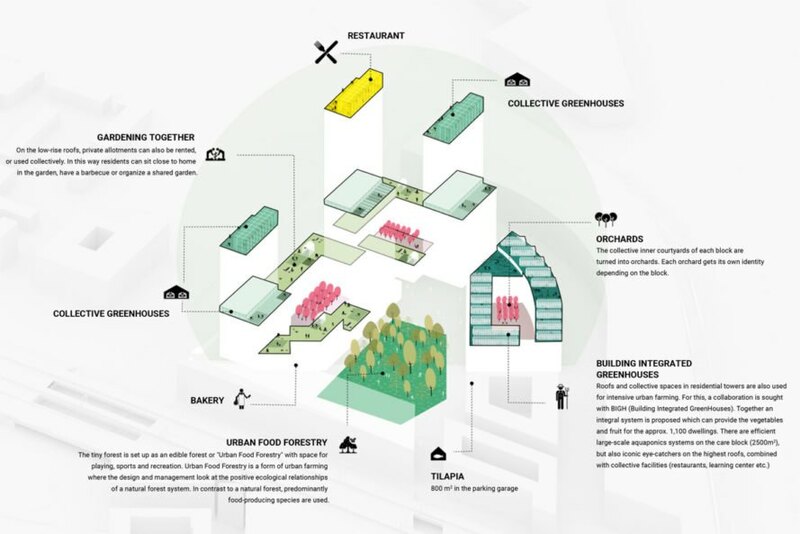 Urban agriculture will also be integrated into every level, making fresh fruits and vegetables widely available to all residents and dramatically reducing their food chain and carbon footprint. The buildings themselves will be climate neutral, meaning their everyday operation will not emit greenhouse gases. This is an important feat, considering buildings and construction account for nearly 40 percent of the world’s total greenhouse gas emissions. In addition to biodiversity, the complex also encourages social and economic diversity. About 60 percent of the residences will be reserved for renters, with the remaining available for ownership or senior housing with at-home care options. The more than 1,125 residences will be listed at a variety of rent scales, which aims to address rising concerns about affordable housing in the city. In response to frequent criticism that high-rise living generally promotes feelings of isolation, the MARK purposely encourages a collective lifestyle and sense of community. The design features numerous communal spaces such as restaurants, pools, shared laundry facilities, gyms, work spaces and artist studios. Residents will also have extensive bike facilities and a fleet of 100 shared cars. Construction for the innovative high-rise complex is expected to finish in 2023. The three buildings will be 80 meters (262 feet), 100 meters (328 feet) and 140 meters (459 feet), which is 28 feet higher than Utrecht’s current tallest building — the Dom Tower. “We all realize that if we build something higher than the Dom Tower, it also has to become something special,” chief architect Alderman Klaas Verschuure said in a statement. 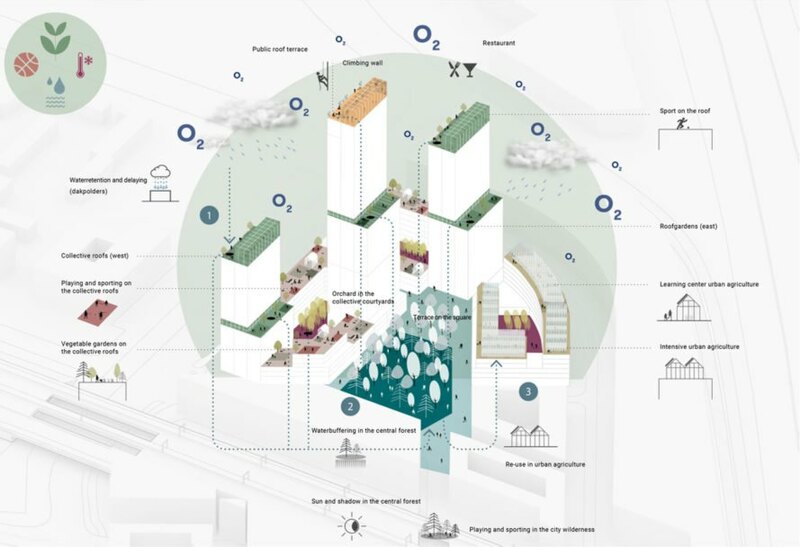 The Netherlands-based consortium of architects, designers and developers behind the project includes Karres en Brands, Stadswaarde, Koopmans Bouwgroep, J.P. van Eesteren, KCAP; Geurst and Schulze. 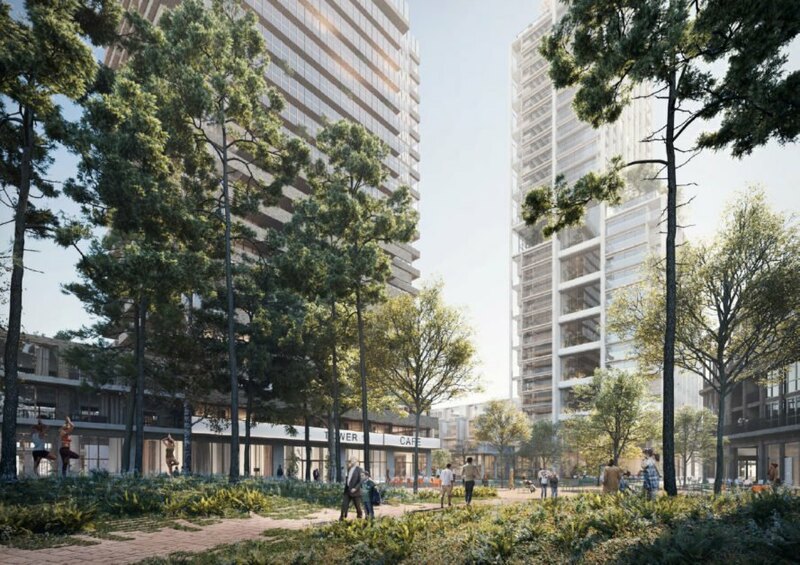 A consortium of architects and developers have proposed a trio of high-rises for Utrecht, Netherlands. The tallest tower would reach 140 m, which would surpass the city's current tallest building. The MARK Vertical Village will house more than 1,125 residences. To foster a sense of community, the towers will include restaurants, pools, gyms, artist studios and more. The other towers will reach up to 80 m and 100 m.
Urban agriculture will also play an important role here, and fresh produce will be widely available to residents. The structures will offer many units for affordable housing. The project is expected to break ground in 2021 and reach completion in 2023.